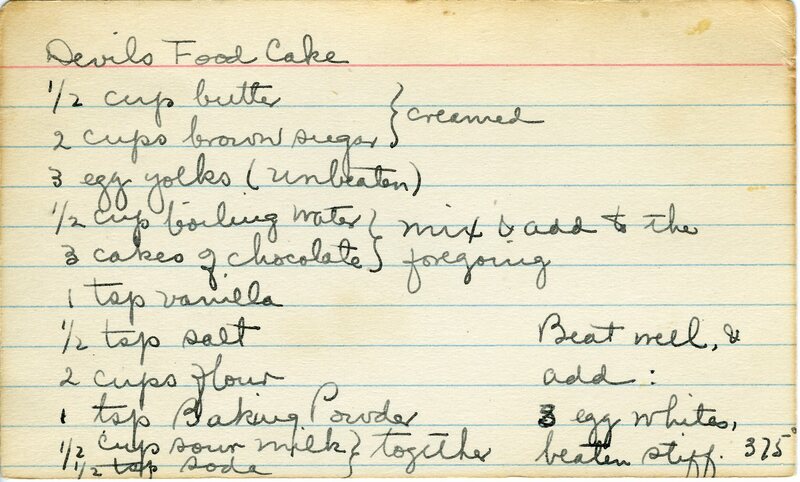 Today we are going to start with some cake recipes. For those of you who thought Devils Food Cake only came from a Betty Crocker box, here is a relatively easy looking cake recipe that probably tastes a whole lot better. It may be a bit labor intensive because there are several steps, but something tells me you should try it! Note, the cakes of chocolate are surely bakers unsweetened chocolate, and for lighter cake you could try cake flour. Depending on the quantity of batter, you could bake this in 8x8s, 9″ rounds or a 9×13. If you make it in a 9×13, be sure to watch the cook time so the middle bakes thoroughly. Enjoy! Beat well and add 3 egg whites, beaten stiff. 375. **Gramma A, please look at that number for the egg whites and tell me if you think it’s 3 or 8. It looks as thought she wrote over a 2 and 8 doesn’t sound right at all. Actually the best – and easiest – chocolate cake is Oscar’s Chocolate Cake (mayonnaise cake). It is still my favorite. Don’t give away my hole card, ha ha.